The staff for this episode was a distinguished one. Jukki Hanada supervised the overall series composition, while Takeo Takahashi directed, as he’d done for Eps. 2 and 6, two previous battle-heavy adventures. This artist is best known as the senior director for the hit series Spice and Wolf (2008-09). Here, Takahashi was assisted by Kiyoshi Matsuda, who mainly worked as a key animator and storyboard artist, but who was working up to the episode directing job. He later was overall director for Kumamiko - Girl Meets Bear (2016). Kimiko Tamai, animation director for this episode, also handled the same task for Episodes 2 and 6. Her work is elegant with strong emotion and careful attention to details, making her my favorite animation director for this series. She had a brief but distinguished career in anime, beginning as a key animator for cel-based series such as The Legend of the Galactic Heroes (6 episodes) and Cardcaptor Sakura (4 episodes), then moving up to episode animation director. In addition to her work on Rozen Maiden, she also directed the animation for Ep. 5 of Spice & Wolf. 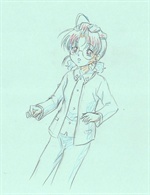 This great genga shuusei from that series is probably also her work. She gained more exposure as animation director for episodes in dark, psychologically intense series like Chaos;HEAd (2008) and Needless (2009), but with the latter series her work in anime production came to an abrupt end. A shame, as her work strikes me as being among the best in the business and a definite asset to the superb art of this series. That said, character designer and senior animatior director Kumi Ishii (whose extraordinary roughs from Ep. 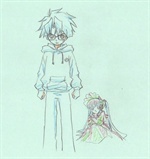 1 can be seen in the Shinku gallery) often took a strong hand to Tamai’s roughs, revising them heavily. From the final impact of this episode, one can often see why: this animator had a visually and emotionally clear image of the series villain Suigintou, and was firm in sticking to it. And yet Tamai’s roughs are always clean, full, dramatic images, plenty good enough for most series. The gallery thus documents an extraordinary collaboration, in which Ishii’s final versions of these frames gain power from the high artistic level of the sketches that Tamai created. Like the next episode, this installment contains many memorable scenes, each well realized by the animators, and so I am happy now to give it a gallery of its own. CAUTION! MAJOR SPOILERS ABOUND IN IMAGES AND DESCRIPTIONS! But holy 'ell, it's the lead-up to Ep. 12, a great ending to a great series. Watch both episodes and then come back and relive your favorite moments.